Should you happen to see a ray of sunshine in Paris, if you follow it, chances are pretty good you’ll find someone sitting in a café, face-forward, basking in its warming rays. And although unofficial in most of the parks and public places, folks here also like to celebrate the arrival of any good weather with un picque-nique. Picnicking in Paris can be a dicey proposition, and you must navigate where and when it’s okay—and where and when it isn’t. Nature is meant to be admired, yes, but only from afar. 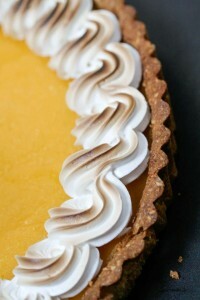 Like those gorgeous pastries lined up in the shop, you’re not supposed to touch, unless permission is expressly granted. However in the past few years, the rules have become more relaxed and often park guards will look the other way if you whip out a sandwich en plein aire, although I recently saw a team of whistle-blowing guards rousting a group in the place des Vosges that had the audacity to start unpacking their fare on the grass. They were rousted pretty quickly, as were the startled tourists who tried to kick back in the jardin des Plantes a few weeks ago when I was strolling around there. However if you need suggestions, there’s two pages of them in Clotilde’s Edible Adventures in Paris. But as Clotilde notes, if you’re discreet and respectful, you can have a nice picnic (almost) anywhere in Paris. For a recent picnic by the river, to put a final period at the end of another summer by the Seine, I made a Lime Meringue Tart. But since someone was bringing cupcakes to this last one, I decided to do something savory. 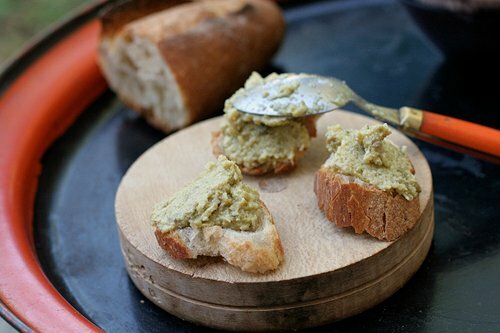 I’d bookmarked the recipe for Artichoke Crostini over at Smitten Kitchen and reading through the recipe, upon inspection, I realized it was actually pretty close to tapenade made with artichokes. In fact, it was exactly the same thing. Did you know that the name of tapenade comes from the word in Provençal for capers, tapéno? So you can’t have tapenade without capers. And in Paris, in my opinion, you can’t have a picnic without a bowl of tapenade. Summer is over and as we polished off the last of the artichoke tapenade, and the rosé that we were swilling with it, to give summer one last bisou goodbye. But because this is so simple to make, and doesn’t require pitting an endless amount of olives like regular tapenade does, I’m going to continue to make this tapenade all year round at home; where I don’t have to worry about anybody blowing the whistle on me. Adapted from Deb at Smitten Kitchen, from a recipe by Mario BataliAn uncle once told me a funny story that he was going to make a recipe for something that called for ‘pickled capers’. So he decided that he would track down fresh capers, since those would, of course, be better than anything in a jar. Needless to say, he didn’t find any. But you shouldn’t have any trouble finding capers in a jar at your local grocer. 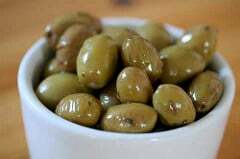 Be sure to rinse them and squeeze them dry; that step removes the unpleasant taste of the brine.I buy my olives in the Arab markets, which are sometimes conserved in a heavily flavored brine, so I rinse them, too. I pit olives by pressing on them with my thumb, being careful to stay out of the way of any squirts of oil, then pluck out the pits. 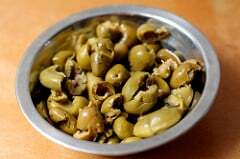 Standard pitted green olives (without pimentos) that come in a jar, which don’t need rinsing, work well in this recipe, too. 1. In the bowl of a food processor, pulse the garlic, olives, capers, artichoke hearts, lemon juice, and olive oil, and until almost smooth, but still chunky. 2. Taste, and add salt, chile powder, and additional lemon juice, if desired. 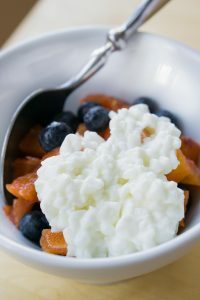 Serve with toasted slices of baguette or crackers. Storage: The tapenade will keep for up to one week in the refrigerator. My husband allways says; “You’re allowed to do anything you want, just don’t get caught doing it!”. But I must say, we haven’t had any trouble having a picknick wherever we wanted. We recently spent a few days in Paris and we found Clotilde’s book very helpfull! We love Paris!! It looks fantastic, and I strongly doubt that it can be stored in the fridge for one week : Ma main à couper qu’il aurait disparu avant, oui :D ! You read my mind! I was just looking for artichoke recipes yesterday, and in fact I marked Deb’s recipe to return to later. But I’m super thrilled to learn the origin of the word ‘tapenade’. I never knew capers were the crucial ingredient. But tell me, is it not difficult to find artichokes over there? I’m in Dublin, and I don’t recall seeing any in the regular ol’ supermarkets, fresh or canned. Maybe I’m just looking on the wrong aisles, who knows. My boyfriend just told me Ryanair’s offering some incredibly low fares to Paris…or as close to Paris as Ryanair flies. I’ll be scouring your site for tips and tricks if we decide to go. Folks might inquire about using fresh artichokes and I’d say that if you’re up for the challenge of peeling and preparing fresh ones, you’re welcome to (you can use the weight measurements I included), but I haven’t tried it as the canned ones really work well here. I wonder whether Jerusalem artichokes, peeled and boiled, would work in this recipe, too? Nearly the time of year for them. Capers, I believe, are pickled nasturtium seeds, no? Canned artichokes are edible in Paris? Good god above. This sounds lovely, and so nice to learn the etymology of tapenade. Oh, thanks for the tip, Jane! We do most of our day-to-day shopping at Lidl, but I never thought to look for artichokes there. Figured if I couldn’t find them in the much bigger stores, there was no way Lidl had them, but it does surprise you sometimes! I’m sure the jarred variety would work just fine. Thanks again, glad to know I’m not alone in the ingredient hunt! I have been wanting to do something with fresh artichokes for ages=merci! In Greektown (Astoria,NY) they are like 4 for a buck and one grows a bit tired of the plain old boiled way. No more bisoux, even for summer! La bise is being outlawed in parts of France in anticipation a bad flu season! Quel dommage! i make a similar tapenade, with even less ingredients: 2 parts green olives, 1 part ground almonds, 1 part capers, olive oil, salt and pepper to taste. Yes!!! Delicious… I’ve never tried a tapenade with both artichokes and olives together. I’ll have to give this recipe a try. I love making tapenade with just artichokes though and when I have the time I use fresh baby artichokes and braise them with a little white wine until tender. It’s not too much work as there is no need to worry about the chokes. It makes for a very deep and “artichoky” tapenade! Thanks for the food inspiration… Now to figure out a way to conjure up the Seine? It wasn’t the guards harassing the picnickers the last time I visited Place des Vosges. I saw a gentleman spread a blanket on the grass for his lady and pull out a loaf of bread and jug of wine. His smooth operation fell apart as they were set upon by two dozen pigeons. They flailed their arms for a while, shooing the birds only to have them resettle on their blankets and plates. Ultimately the picnickers were rousted without enjoying a bite. Perhaps the pigeons are on the payroll? I can make a meal out of a picnic like that… very happily with a nice bottle of wine. I want to have picnic right now, and a picnic with this tapenade. Looks delicious! Oh my goodness this is a bit of heaven. I must try this asap! I tried Deb’s recipe shortly after she posted with great success. I brought it into work and one of my co-workers said it tasted just like this expensive tapenade she had purchased, but couldn’t justify purchasing again. The chili powder sounds like a great addition. This looks amazing. I can imagine myself sitting on a beautiful patio with these and some friends and good conversation. I will be trying these soon. Thanks for sharing them with us! I can imagine that picknicking in Paris is not always a walk in the park! But it looks like you’ve found a way to make it work, and it must be delightful. The tapenade looks terrific! Thanks – I am another weirdo delighted to learn the origin of the word tapenade! Also glad to see I needn’t wrestle with fresh artichokes for this. I miss Lidl, for all kinds of things! This is the kind of thing I could eat for lunch on a slice or two of decent bread. I also like spreads like this on sandwiches rather than using mayo. Do you suppose it would work as the spread in a muffletta if left a little chunkier? Susan: Absolutely! I use tapenade as a sandwich spread all the time. Ham, chicken, or mixed vegetables (especially sun-dried tomatoes and/or anchovies) are great. Feel free to make it as smooth or a chunky as you want. Valérie: It’s not that difficult; there’s a just a few places where it is interdit, and you need to know where…or you find out pretty quickly! It’s might be a bit far from your normal haunts, but I always liked picnicking in the Parc des Buttes Chaumont. Lots of good spots out there. Much more casual – more ‘populaire,’ as they say. Mmmm…I can almost taste the sunshine. This is my first post, so I’m going to be cheesy (it’s the sunshine. really.) and say that I love your blog. I first started reading about a week ago when my copy of The Perfect Scoop came in the mail. I spent the last few nights reading back through the archives and went right ahead and ordered your most recent book. Thank you for the ongoing inspiration! With the addition of a few more tablespoons of olive oil this recipe would be delicious on hot fettucini sprinkled with a bit of grated parmesan! :) Yummmm! I have made something similar and included some roasted cashew nuts roughly pounded in a mortar. Rich but adds a sweetness and depth…mmm. I am having a pal over for dinner and she has some food allergies that drive her bonkers. This recipe is safe (sans chilli) and she is going to be thrilled to bits when it comes out. It is spring here now (Australia) so I am looking forward to picnicking and have followed your summer antics jealously. Bring on the rose! Oh I absolutely love tapenade. The photos definitely makes you eat with your eyes first, but I’m more than sure that the taste will be unforgettable! In July while visiting Luxembourg Gardens there was a woman with her baby and stroller lounging on the grass. A policeman came up to her and told her she had to be off the grass. She was ready and willing to comply until an elderly gentleman who was seated not on the grass, nearby came to her defense. He began arguing loudly with the policeman and pointing his finger in the policeman’s face. It was funny to watch their exchange. The woman remained on the grass as they argued. Here in the US we would not dare argue publicly with the police. They yelled at each other for 20 minutes waving their hands in each others faces. As they were arguing the woman quietly strolled away with her child. It was an interesting cultural experience to watch. One night later we were dining at a well known restaurant when a man at the table next to us tasted his wine and refused the bottle. An argument ensued again with finger pointing in the face. They decanted the bottle and let it breathe, he still refused it. The waitress was very angry and brought the chef to talk some sense into the patron. It did not work and there was continued finger pointing and arguing. He ordered an altogether different bottle of wine and finally was satisfied then finished his meal happy, as if he had not just argued for half an hour. This was the first time I ever saw bizarre in your face finger pointing in Paris and then to experience it twice in one trip was odd. Pain au levain toast, a little Chevrette du Poitou, some charcoal roasted and marinated peppers, artichoke tapenade….yum. Sounds like dinner. All it needs are a few cherry tomatoes from the field to freshen up your mouth and a glass (or so) of sauvignon blanc. Sharon: Not to generalize, but in general, French people can get explosive about something, they forget about it a few moments later. I’ve had to learn that when people get riled up about something, it’s just because they’re asserting themselves. And it’s also kind of a challenge. They also like the “story” more than the results. I got stopped by the police (well, 4 of them..) the other night for riding a bike the wrong way down a deserted one-way street. It wasn’t like I was endangering anyone, or required four heavily-armed policemen to show me the error of my ways, but they wanted to hear me say something that would explain my behavior, rather than merely give me a ticket. Which I did talk my way out of. Whew! 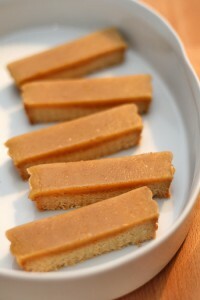 I made this today and it is wonderfully savory and briney and so addictive. I was so anxious to make it that I just used the pimento stuffed olives (quickly rinsed) I had on hand. I did take the pimentos out, but then minced a few and added them for color after the tapenade had been made. It was an outstanding accompaniment with the fresh grilled albacore we had for dinner. I can see this being a staple to use as an condiment, an appetizer alone or with several other things, and as a sandwich spread. Very versatile! Thanks, David. Yum – Can’t wait to try this. 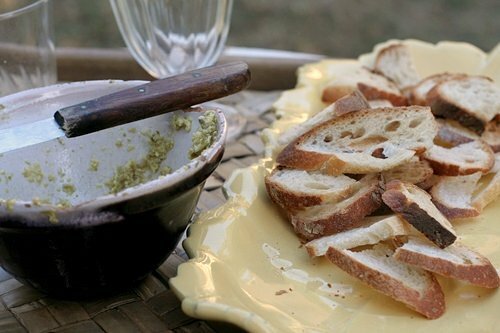 On bread and all the other things I slather tapenade on! Next time I’ll use the capers. This is for Jessica in Dublin, I, too, live in Ireland. I find canned artichokes at Tesco and only sometimes at Lidl. It’s the olives that are difficult to find especially if you are a ‘culchie’! I had no idea picniking was not allowed…….last yr we spread out in the Luxembourg Gardens with wine glasses, blanket, wine and cheese. No one bothered us! I guess we were lucky? I have made Mario’s spread many a time. It’s easy and a no brainer and pretty good. Just made some for one of our last beautiful evenings here in Ohio. 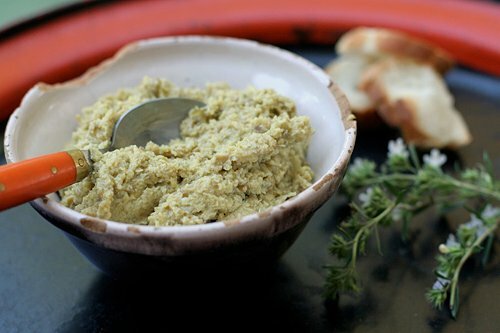 What a perfect, simple, delicious tapenade! And I had all of the ingredients in my pantry! Merci David! I made this tapenade this past weekend, and we all really enjoyed it. Thanks for the recipe! So while I’ve seen people getting rousted, I’ve not seen anyone get fined. There’s also a ban on drinking in public in Paris. Once again, they’re rather lax at enforcing some of these things, as long as you keep it discreet and orderly. But still, the laws apparently do exist, to protect the…um…er…well, whatever it is they’re protecting us from. Thank you: I am always on the lookout for things to do with canned artichokes–I am not sure I’ll ever master trimming fresh ones, yet I’m always unsure what you can do with canned ones as they are not exactly ‘fresh’ are they? I am just never sure how the flavor would stand up (too watery? I’m not sure)–but in this case, if that is even a valid concern, the olives would certainly add some assertiveness! Anyone in/visiting/passing through Sacramento can probably find these at Corti Bros. http://www.cortibros.biz/ — it’s the best. I wish we had ONE go to place like that for stocking a pantry in San Francisco. Robert: I often just use regular canned artichokes, which people have reported are easier to find, so I made an adjustment to the recipe as either will work fine. I’ve been off-line for a while and just getting to read your great posts. This looks delicious and so simple, rustic-elegant. One question – what type of chile powder do you use? What a healthy meal. Having artichoke in our diet is a good source of some nutrients such as dietary fiber, folate, magnesium, vitamin C etc. I made this for a party, and it was delicious. Thank you! I’m coming late to this thread, but… Canned artichoke hearts (canned in brine, not jarred in oil) are fairly easy to find in the U.S. The problem is that of the half dozen brands I’ve tried, they’re all pretty bad, tasting tinned, or metallic, and/or badly “off”, and badly trimmed to boot. There’s only one brand I’ve found that’s really good — no off flavors & no tough leaves: “Bella Famiglia Premium Artichoke Hearts Quartered”. (The mfg # is 1-800-257-6174 x225) Standard sized can, 13.75 oz (390g); drained weight 8.5 oz (240g). The cans I have in the pantry at the moment are labeled Product of Peru, but I’ve also seen Spain. They’re quartered baby artichokes and so are quite small, with a max size less that the first joint of your thumb with absolutely no tough leaves that I’ve ever found. Perfect for recipes such as this. I fell in love with an Italian artichoke and garlic cream but when it became prohibitively expensive I went without. Today I ran across a can of artichoke hearts in brine at Trader Joe’s and I got the idea to make my own. I used your recipe–without the olives and capers–and added parsley. It comes pretty close to the store-bought crema. However, I failed to notice the the astronomical sodium level of the artichokes and added salt before tasting, something I almost never do! Next time I’ll rinse the chokes before using and will not any salt until I taste it. Since I plan to use it on bland dishes like cauliflower the salt factor will even itself out. Next time I’ll try adding the olives. Many thanks for the recipe!